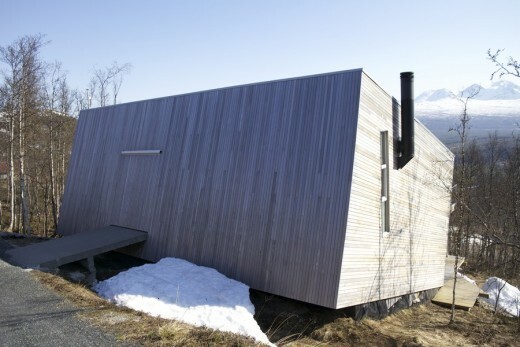 Situated on a steep hillside covered in trees the site overlooks the valley and the Målselv river below. The area is part of the Northern most alpine ski resort in Norway and the Målselv river is famed for its rich salmon fishing. The area has strict building regulations stipulating the roof angle, roofs to be covered in wood, slate or grass, no visible cellars etc. 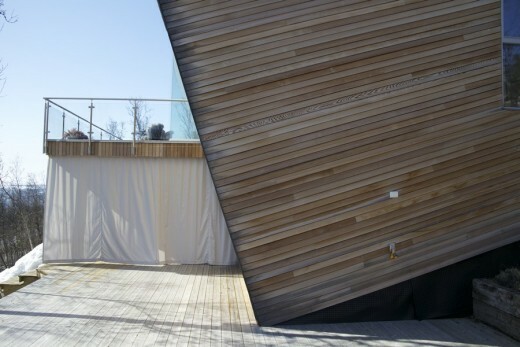 In as much a challenge to the regulations, but also answering to all of them, the conceptual design is that of a simple wooden box tilted on the natural angle of the terrain. The steep slope gave room to play with different levels in the floor plans and section of the building. 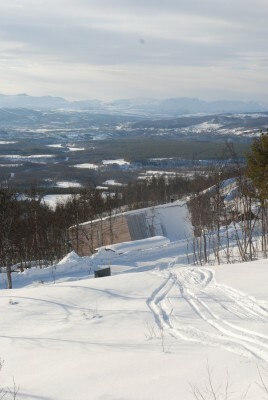 On one side providing protection against the fall-winds and the deep snow and on the other opening up to the panoramic view of the valley, the river and the mountains in the far distance. Another main element of the conceptual design is the ability to close up the box all together, thus giving the owners no need for worry while they are away. 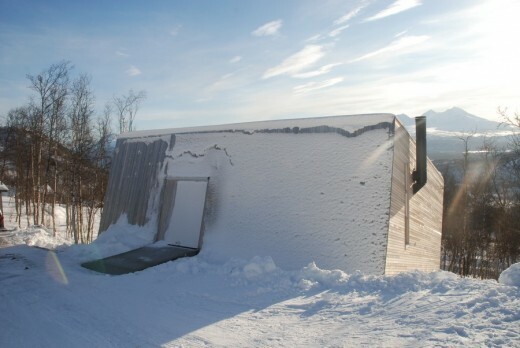 Apart from providing security this feature protects the building from the harsh and seasonally very cold weather and deep snow. The cabin´s exterior is clad in natural cedar wood minimizing the need for regular maintenance and accentuating the form of a wooden box. 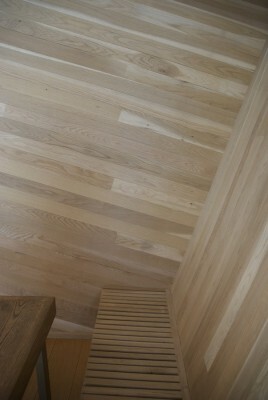 The inside of the outer walls of the box clad in natural, untreated oak, other interior elements carefully treated to give contrast to the main concept of a wooden box. The only access to the cabin is via a cantilivered bridge. And when opened the wall section provides a protected entrance leading into the hall overlooking the kitchen, dining area and living room a flight of stairs below. The first level houses two bedrooms, and addtional sleeping area on natural lofts, and a bathroom. The main level houses the kitchen and the dining area with a long table and a bench along the length of the slanted wall. 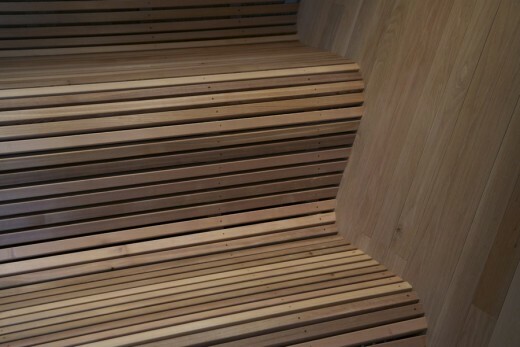 The angle of the wall provinding a natural backrest. Access to the cantilivered terrasse between the kitchen and the living room. The steep slope of the site also offers an unobstructed view from the main bedroom downstairs, the bedroom only separated from the spacious bathroom by the oval construction of the shower. 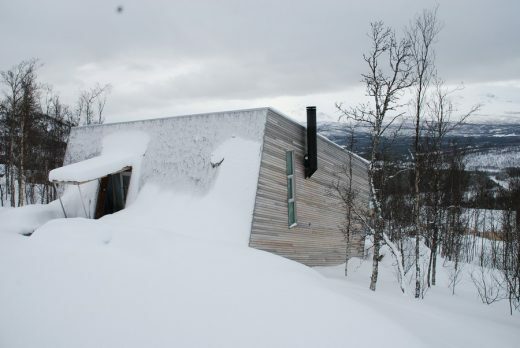 The sauna also takes advantage of the slanted outer wall to provide comfortable seating and has direct access to the outside pool or – if you prefer – the snow.